A trilobite is any of an extinct group of arthropods found as fossils in marine deposits. Trilobites were the dominant creatures of the Cambrian seas about 500 million years ago. From the early species, many others evolved and reached a peak in the Ordovician period. They were still important in Silurian times but only a few species survived after then. The latest trilobites lived during the Permian period, about 220 million years ago, after which they disappeared forever. The trilobites form a distinct class of the joint-limbed animals known as arthropods. The name of the class is Trilobita, after the way in which the body appears divided into three lobes by two grooves running along its length. Like the other arthropods trilobites had an exoskeleton (external skeleton). It was probably horny, and, at least on the upper surface, heavily impregnated with calcium carbonate. Trilobite fossils are often found only as fragments but a complete specimen will show that as well as the three longitudinal divisions, the body has three divisions in the other direction. At the front end is the semicircular or triangular head-shield. The central part of the head-shield is raised and is known as the glabella. It is continuous with the axis of the rest of the body. Running across the glabella there are usually a number of grooves or furrows that indicate a segmented origin for the head. The furrows are usually prominent in the earlier trilobites but gradually disappeared as the later ones evolved. Some of the most advanced species have no furrows at all. The outer parts of the head-shield are known as cheeks and in most species they bear the eyes. Each cheek (if eyes are present) is traversed by a fine groove called the facial suture. The head-shield frequently has a broad, flat broader around it that curves underneath the head. The glabella may or may not reach to the front of the head-shield. The hind-angles of the shield are often prolonged into spines. Behind the head is the thorax which is made up of a number of segments. In general, the early species had more thoracic segments than the later ones but Agnostus and similar species are obvious exceptions. The central parts of the segments form the axis while the lateral parts are called pleurae. In life, the segments were free, enabling the animals in some cases to roll up rather as a woodlouse does. The third body division is the pygidium or tail. It is not present in some of the primitive species but in some Ordovician species (e.g., Asaphus) it is very large. The pygidium is made up of segments rather like the thorax but the segments of the tail are all fused together and not moveable. It is still divided into axis and pleurae but the axis may not reach to the end. The majority of fossil trilobites do not give any indication of limbs but from some rocks, geologists have obtained trilobites showing the undersurface and limbs. Careful sectioning of rolled-up trilobites has also shown the limb structure. Every segment except the last had a pair of limbs. The firs pair of limbs or appendages were long filaments or antennae. The others were all forked – one part being fringed with bristles – and were no doubt used for moving about. The bases of the head-limbs were toothed and presumably acted as jaws. 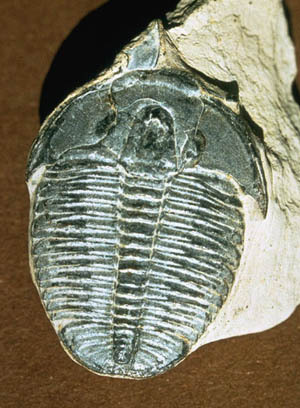 The flattened shape of the trilobites and the position of the eyes on top of the head suggests a bottom-living life on the whole although they could no doubt swim with their many limbs.